Guy dolphins also give each other "high-fives." Many people already realize that dolphins are extremely intelligent animals with close and complex social relationships — but scientists just discovered another fascinating behavior that shows how similar to human beings these creatures are. 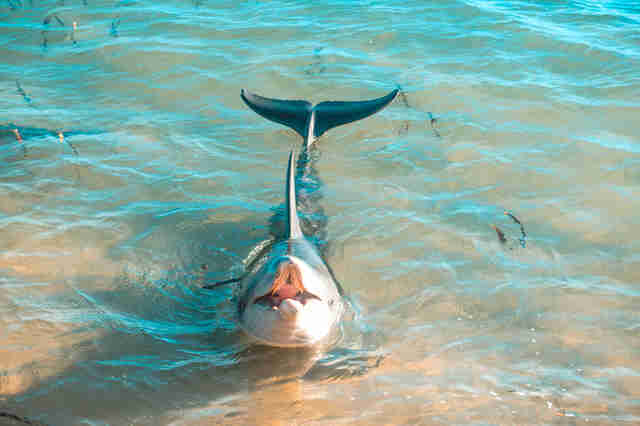 Scientists from the Dolphin Alliance Project were listening to the particular whistles made by bottlenose dolphins in Shark Bay, Australia, when they started to notice a pattern. 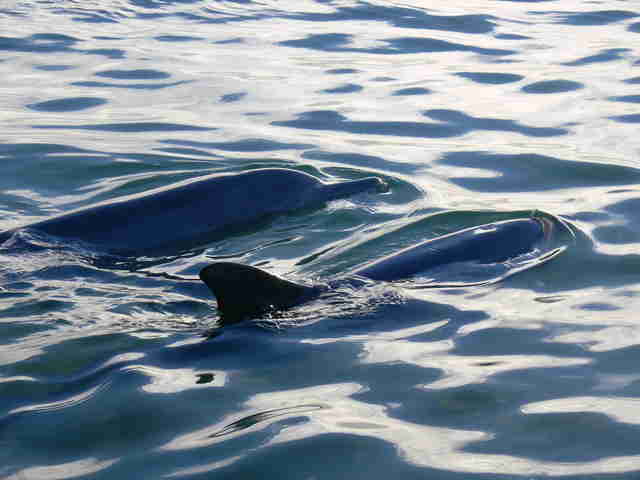 Researchers have been studying these dolphins for decades. They already knew that young male dolphins have a distinct whistle they use to introduce themselves to groups — and they believed that once the dolphins got older and bonded with a few other guy friends, this distinctive whistle that was the individual's name fell away. Using underwater microphones, scientists recorded the whistles, separated them out and found something they didn't expect. Even though the male bottlenose dolphins were adults, scientists could still hear the signature whistles of 17 individuals. 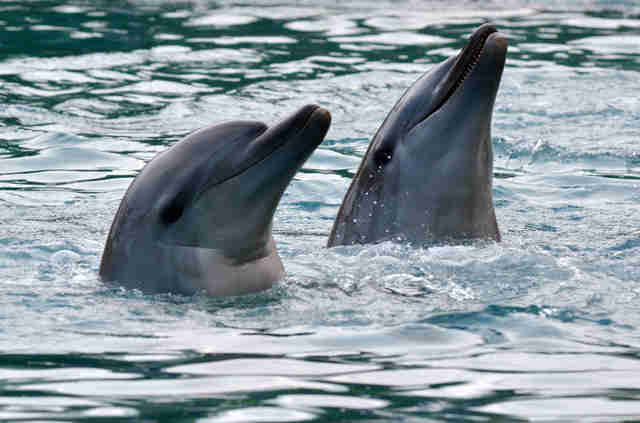 So the male dolphins — who incidentally have also been seen giving each other friendly slaps with their flippers, almost like high fives — were still using their individual names, even after they'd become part of a closely bonded social group. Among chatty individuals in the animal kingdom — like elephants, certain kinds of parrots, bats and apes — it is normal to use a similar call to build friendships. 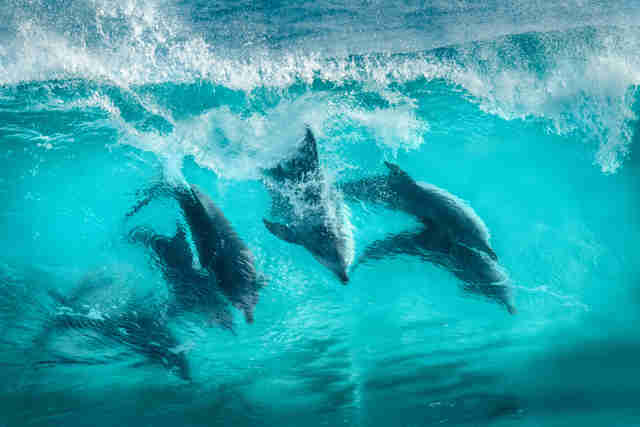 "With male bottlenose dolphins, precisely the opposite happens," Michael Krützen, a professor of anthropology and evolutionary biology at the University of Zurich, said in a release on the new findings. "Each male keeps his own, individual call, and distinguishes himself from his allies, even when they develop an incredibly strong bond." 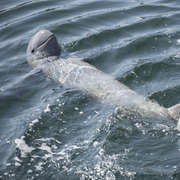 Stephanie King, lead author of the study, added: "Besides humans, so far only dolphins appear to retain their individual 'names' when it comes to forming close, long-lasting, cooperative relationships." That's certainly something to whistle home about. You can stay in the know about fascinating discoveries about dolphins and animal behavior by following the Dolphin Alliance Project.